Epilepsy is one of the most common neurological disorders in the world and in our hemisphere, affecting millions of people. 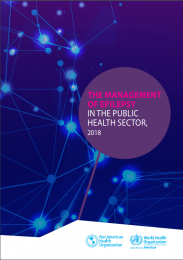 However, it is estimated that more than half of people with epilepsy in Latin America and the Caribbean (LAC) do not receive care of any kind from health services. One of the key problems is a limited ability to identify, manage, and monitor epilepsy cases in primary health care (PHC) services. Furthermore, in most LAC countries, the secondary (specialized) care level either has serious limitations or is nearly nonexistent (PAHO, 2011; PAHO/ILAE/IBE, 2013)... This document offers guidelines and a frame of reference to help countries design their national epilepsy programs and should be regarded as complementing the Strategy and Plan of Action on Epilepsy (PAHO,2011) adopted by all the ministers of health of the Americas at the Directing Council of PAHO, and also complementing the resolution and document approved by the World Health Assembly (WHO, 2015).